LAS VEGAS, NV — Last year Intel introduced its Compute Card initiative, aimed mostly at manufacturers of specialized PCs and smart devices that benefit from high integration, easy installation, and a standardized dimension or interface. This has, apparently, given makers of consumer computers an opportunity in ultra-small desktop PCs. 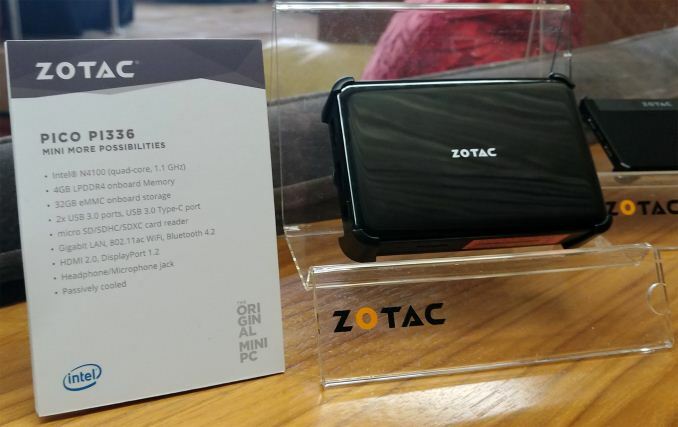 This year at CES, ZOTAC has demonstrated its new-generation ultra-small ZBOX Pico PCs that looks like a pile of credit cards, but still offers a rather decent feature-set and connectivity. The first is the PI226, which is very small, and in addition there is a larger ZBOX Pico PI336 with enhanced connectivity. 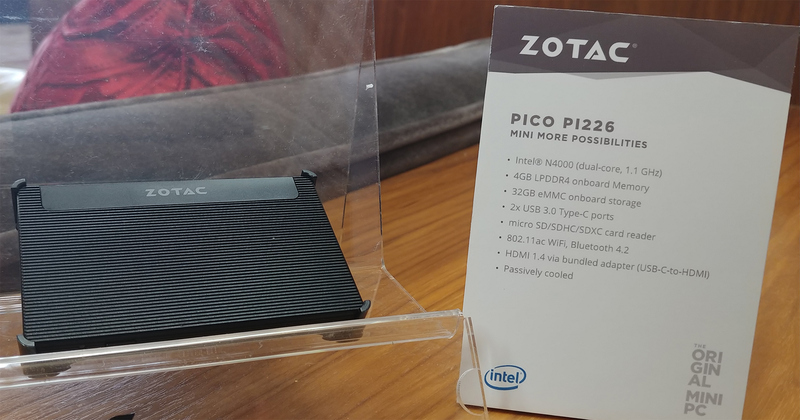 ZOTAC’s ZBOX Pico PI226 is based on Intel’s Celeron N4000 SoC, which has two cores and the UHD 600 graphics engine, but is also the most 'affordable' mobile Gemini Lake chip that Intel lists for $107. Because of the new SoC, the ZBOX Pico PI226 offers a bit higher general-purpose performance as well as improved media processing capabilities when compared to its predecessor the ZBOX Pico PI225 launched last year. Just like its predecessor, the ZBOX Pico PI226 comes in black metallic chassis and does not require any active cooling. 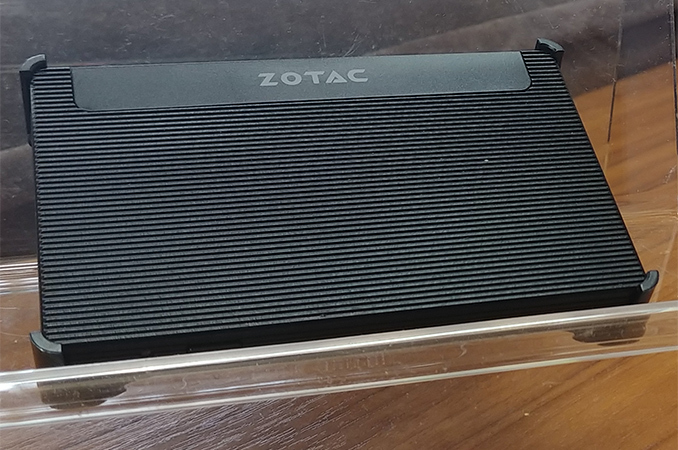 The listed TDP of the Celeron N4000 SoC is just 6.5 W, but nevertheless how ZOTAC has postitioned the TDP means that this amount of heat can be dissipated by convection alone in this chassis. The credit card-sized computer is equipped with 4 GB of LPDDR4 memory, 32 GB eMMC storage and a microSD card reader to expand storage capabilities. Wireless connectivity of the tiny PC includes a 802.11ac Wi-Fi + Bluetooth 4.2 wireless module, whereas wired connectivity is comprised of two USB 3.0 Type-C ports and a micro-USB power header. 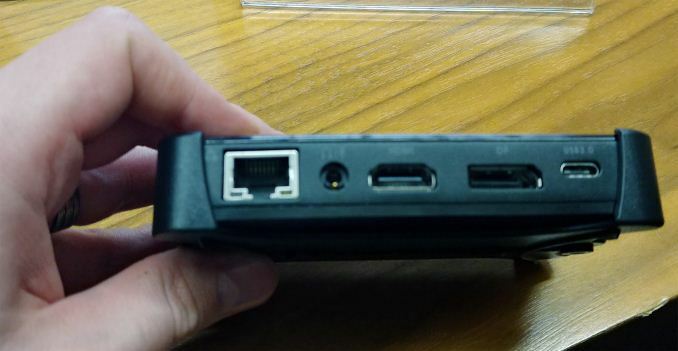 ZOTAC plans to bundle a USB-C dongle with an HDMI and two USB Type-A ports with the Pico PI226, just like it does with its current-generation ZBOX Pico PI225. ZOTAC’s ZBOX Pico PI336 is considerably larger than the Pico PI226, but is still unbelievably small for a desktop computer. This one is based on the quad-core Celeron N4100 with the UHD 600 iGPU and thus offers higher performance in multi-threaded applications when compared to the PI226. It has the same RAM/storage configuration, with 4 GB of LPDDR4 memory, 32 GB of eMMC NAND flash and a microSD card reader. Where the ZBOX Pico PI336 clearly excels the Pico PI226 is connectivity. In addition to 802.11ac Wi-Fi, Bluetooth 4.2, a USB 3.0 Type-C port, this one is equipped with a GbE connector, two USB 3.0 Type-A headers, an HDMI 2.0 output, a DisplayPort 1.2 as well as a 3.5-mm TRRS audio jack. ZOTAC plans to start selling the new ZBOX Pico PI226 and PI336 sometimes in the second quarter. Pricing has not been announced, but since Intel did not change pricing of its SoCs since the Apollo Lake generation, it makes sense to expect pricing of the Pico PI226 to be in the same ballpark with that of the Pico PI225. The latter hit the market in November and is available for less than $200. ZOTAC’s ZBOX Pico PI3-series PCs also cost around $200, so expect the new Pico PI336 to retail for a similar amount of money. Celeron J3355 is listed as $107 on ARK.